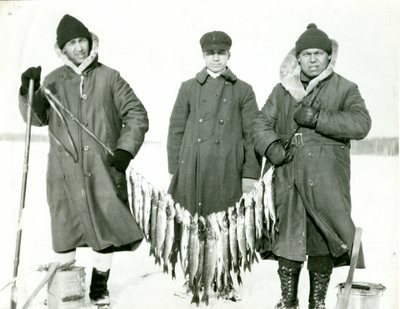 "Boxers at Charley Miller's Camp "
A black and white photograph of three men with their catch from ice fishing. A handwritten note on the back indicates the photo includes boxer Johnny Risko, heavy-weight contender, who appears to be the man in the middle. Although not labeled, the man on the left appears to be Charley Miller, and Jack Dempsey on the right. Stamped on the back, "Miller's Camps," Greenville, Maine.